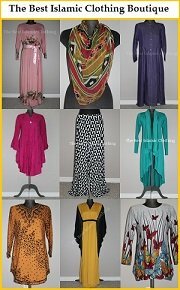 Islamic clothing photos - do you want to share your best abaya, hijab and modest attire; snap a photo and upload it here for the world to see! SHARE Your Islamic Clothing Photos Here! Share and upload Islamic clothing photos, abaya, hijab and modest dressing etc. here. Have any of your favorite clothes that you are proud of, snap a photo and share it with the world! There are many ways in which you can present your Islamic clothing photos and modest dressing pictures. Maybe a cropped image of your hijab with your favorite abaya or office wear or even your usual preferred college wear. Or a shot of friends and family at a wedding or Eid party in your house. How about your practical Islamic sports wear during your regular gym session or aerobic work out? Or just have some fun with your hijaby beach wear or swimming wear. Upload YOUR Islamic clothing photos and share them with the WORLD! Find your favorite Islamic attire or modest dressing that you are proud of to share with us. Snap a photo and share it with the world. Let others STAR your clothe & style! After you upload and share your beautiful photo, other people can score it using a star rating system. They can comment, give ideas, and tell you what they like or what can	be improved about your clothe & style. Star OTHER sisters' photos! Browse other sister's clothe, hijab etc. and score them using the same star rating system. Leave comments, add tips and ideas, give suggestions and help other sisters out there just like yourself. The photo has to include Islamic dressing and modest attire in some way or form. The photo has to be your own, taken by you, or by a family member or friends, with their permission. Just fill out the form below, upload your own photos, let other sisters score them, and don't forget to score other sisters' photos too. It's surely a lot of fun, so let's start NOW! Got photos of your favorite Islamic clothing or modest dressing? Post them here! Proud of your abaya, hijab, jilbab, maxi dresses, caftan, long skirts, tunic etc.? Share tips and ideas or need advice about your fashion and style? Take photos, upload them, and share them with all other Muslimah around the world or solicit feedback from others. Click on the button and find the one on your computer. Select it and click on the button to choose it. If you want to upload up to 3 more images then click on the link. I love to wear this kind of outfit to work. AMIRA HIJAB / KURTA BLOUSE / SKIRT (MERMAID DESIGN).